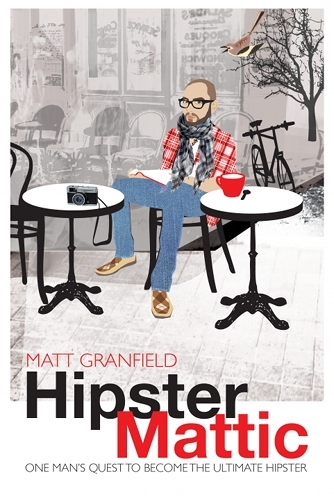 Matt Granfield’s adventures are eyerollingly funny with just the right touch of irony. But be careful. You might find a little bit of yourself in there. One day, Matt Granfield’s girlfriend breaks up with him because ‘you don’t even know who you are!’ She also says a bunch of other things, but this is the one he takes to heart. He decides to make something of himself…by becoming the ultimate hipster. What follows is a hilarious satire through one man’s quest to be cool—no matter how. What is a hipster? The term hipster is based on the word ‘hip’, which once upon a time referred to people in the know, or the cool kids who always did everything first. Nowadays it’s more of a derogatory term because while I firmly believe that everyone has a tiny bit of hipster in them (if only by definition) no one wants to be called one. These days they can be found in skinny jeans— the men wear skinnier jeans than the women—drinking black coffee and wearing vintage clothing. According to the book, a true hipster requires: the ultimate plaid shirt, an ironic tattoo, the ability to knit, vintage ironic clothing, a fixie bike, a coffee addiction and possibly Scrabble jewellery. The current ‘hipster’ trends don’t strike me as very original since they seem to take old trends that people have forgotten about and revive them, and suddenly they’re cool again. Nothing seems to be original except maybe the Scrabble jewelry. Also, maybe I’m just showing my age but I can’t seem to remember any decade—whether through reading history or actually experiencing it—where people liked skinny jeans as much as this one. I found this book hilariously funny. Sometimes Granfield can sound like a bit of a loser—there some ‘Are you serious?’ moments—but then you remember it is a satire (the publicity says so) and you realise, hopefully, he’s not that dumb. There’s also something relatable in Granfield’s need to be cool—you remember being in high school and wanting to be one of the cool kids while being true to yourself. In the end I laughed along with Granfield’s often disastrous misadventures, and by the time I got to the lesson in the end—that says everyone spends the rest of their lives figuring out who they are so it’s an ever evolving process; also, dude, you’re not a hipster—I’ve had a pretty good time. I spent quite a part of the book worried that I was a hipster—I now admit to listening to hipster music—as I felt that half the people being described were my knitting, vegetarian, vintage-bike-owning friends. Fortunately, my dress sense is too relaxed to be hipster—not a pair of skinny jeans in sight)—and I enjoy reading about current events, which is probably not cool. Therefore, I am not a hipster. I hope. A book for anyone who wants a good laugh. Granfield’s adventures are eyerollingly funny with just the right touch of irony. But be careful. You might find a little bit of yourself in there. I’ll have to read this some time!! The use of the word hipster is thrown around so haphazardly now, but really at the end of the day it’s just another social construct with no significance, begging to be mocked. Have you seen the Honda Jazz ad with all the hipsters? Pretty accurate take on the stereotypes.